The Morningstar SureSine SI-300-115V-UL is an ideal inverter for small off-grid systems including cabins, RVs, boats, and remote power systems for telecommunications and other off-grid applications. 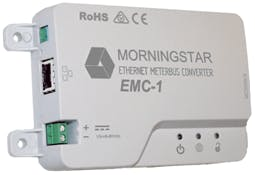 Morningstar equipment is especially popular in the telecommunications industry due to exceptional reliability, an efficient design, and low radio frequency interference. 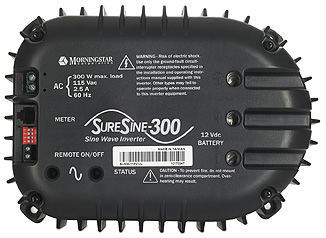 The Morningstar SureSine inverter accepts 12Vdc input and outputs 300 watts of continuous 115Vac sinewave power with 600 watts of surge capacity on tap. This is an ideal inverter for applications with relatively small AC power requirements such as lighting in an off-grid home. These inverters are commonly used to power radios and other remote equipment where AC power is needed in addition to 12 volt battery power. Morningstar’s proven track record and the robust design of the Suresine 300 ensures years of reliable operation. Pure Sine Wave - Quality AC equivalent to grid power, extends the life of the household appliances (lights, TV, fans) and improves load performance. Outstanding Surge Capability – Handles up to a 200% surge during load start-up and a maximum of 600 watts. High efficiency - High peak efficiency reduces heating and makes more solar energy available for powering loads. Low Self-Consumption - The SureSine consumes 450mA while powering loads. During no load conditions, the SureSine automatically powers down to stand-by mode, conserving solar energy by reducing self-consumption to one tenth of operating consumption. Extensive Electronic Protections - The SureSine protects automatically against faults and user mistakes such as short circuit, overload, high temperature and low voltage disconnect. Recovers automatically from most faults. No Internal Cooling Fan design - Fans often fail in harsh environments and are noisy, consume power and blow dirt into the electronics. Suitable For Tropical Regions - The SureSine protects against harsh tropical and marine environment by using epoxy encapsulation, conformal coating, stainless steel hardware, and an anodized aluminum enclosure. Remote On/Off - Improves safety, easy to install the SureSine in an inaccessible location or enclosure, and reduces system cost by avoiding the need to add an AC safety disconnect to the system.